I love mustard, and have wanted to try making my own. Over the weekend, I came across a homemade mustard recipe on the fiercely awesome local food website Simple, Good, and Tasty, and couldn’t resist trying it, especially after seeing their suggestion for honey mustard. Why, you ask? Because I have a new jar of delicious local honey burning a hole in my apron pocket. I decided to take an uncommon approach and use a bit of my buckwheat honey in the mustard recipe instead of a light honey, with some added allspice and turmeric. The result was an awesomely tasty mustard, with a whole lot of punch and just a hint of a dark, mysterious sweetness. The honey balances out the mustard’s fire, and the pungent flavor of the buckwheat compliments the turmeric and allspice. I didn’t add a lot of honey because I didn’t want too much sugar. But if you like a sweeter honey mustard, go hog wild – Simple, Good and Tasty recommends mixing honey and mustard at a 1:1 ratio. Whether you add a little or a lot of honey, it is sure to please. The texture is rustic; it is nubby and grainy, like all those delicious French whole grain mustards. And while the flavor is so complex, the ingredients are remarkably simple. I was really impressed, and honestly, I’ve tasted a lot of mustards – trying out new mustards used to be one of my little culinary addictions. And let me tell you, this mustard definitely, uh, cuts the mustard. I know, I know, that was terrible. I promise, the mustard is better than my corny sense of humor. I smeared some of my fresh mustard on a turkey burger, and used a little more mixed with flax oil as a sauce on roasted pattypan squashes and brussels sprouts. It was divine. And better yet, it is wildly, wildly, wildly simple. 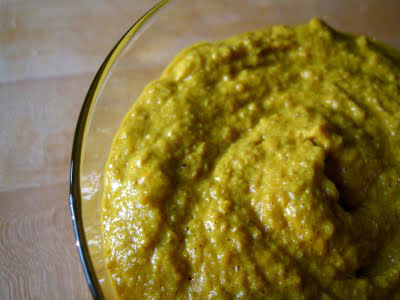 If you can run a blender, you can make your own mustard. Make it as directed below, or throw your own spin on the recipe – it could handle any number of variations on spices and flavorings. Want plain mustard? No problem! If you prefer to make mustard without the honey, feel free to omit it. Add spices as desired, or leave plain. Plain mustard with only mustard seeds, water, and vinegar is still totally delicious, and how I make it most of the time. If you want plain mustard, feel free to omit the honey and spices. It is delicious! Place mustard seeds, apple cider vinegar, and 1/3 c water in a jar. Cover tightly, and let sit on the counter for 2 days. 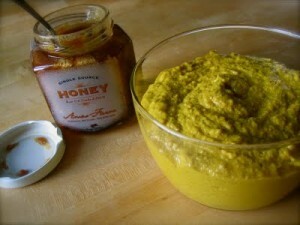 Dump mustard mixture, honey, turmeric, allspice, sea salt and 1-2 T of water in a blender. Pulse a few times, then mix until it reaches desired consistency. Add additional 1 T of water if needed, and adjust seasonings to taste. Store in a well sealed jar in the fridge.